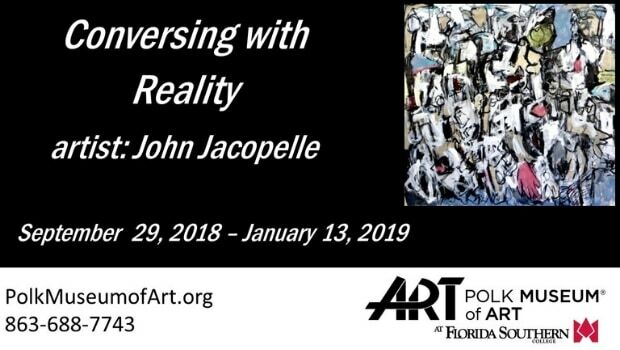 Conversing with Reality celebrates the most recent paintings of contemporary visual artist John Jacopelle. Devoid of preconceived ideas and direction, Jacopelle’s work takes a stream-of-consciousness approach, where the “act of doing” or process is equally important to the finished piece. Rendered in ambiguity yet painted with clear definitiveness, organic shapes, rhythmic lines, and glyphic marks develop as the artist works upon his paintings, leaving each piece open to the viewers’ own interpretation. Jacopelle’s work has been exhibited up and down the East Coast and can be found in both corporate and private collections throughout the United States and England. Jacopelle holds a BFA from the School of Art and Design at Purchase College, State University of New York in Westchester County.